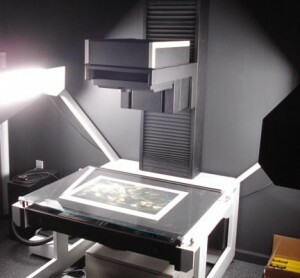 DRS utilizes a Cruse Scanner to digitally capture images for print reproduction. The Cruse Scanner line is renowned as one of the best scanners available and it is ideally suited for rare documents, fragile documents and three dimensional scans. The cruse scanner is a touch- less scanner. That means it captures images without having to cover or touch the objects being scanned in any way. The Cruse Scanner unique lighting system insures that the objects being scanned are in true light. Moreover it is balanced light that insures that the entire surface of the objects and documents being scanned are all in the same light. The Cruse Scanner is great for all types of documents and objects because it is a no-touch scanning system. That means that fragile objects and documents can be safely scanned without any danger of the scanning process harming them. It is easy to see why The Cruse Scanner is so well respected as one of the leading flatbed scanners available. At DRS, we add still another dimension to our service and that is training. We recognize that having great state of the art equipment also requires operators who are fully trained to get the highest performance out of the equipment. At DRS, we invest heavily in training to insure that our state of the art equipment results in state of the art print reproduction for our clients in the greater Philadelphia region and beyond.